Deer hunters are bombarded with information about deer, much of it true, but some of it complete hogwash. Some information is past down from one hunter to another as gospel truth, yet it has no foothold in reality. Here are seven of the most commonly spread hunting myths, which just aren’t true. This is a common hunting myth, which actually has some truth to it. Deer can see colors, but there are certain colors they cannot see. Deer see blues and yellows very well, but they cannot see reds and greens. Knowing this can help you decide what to wear and what not to wear while deer hunting. RELATED: Does Full Moon Really Affect Deer Hunting? Many hunters believe that deer have poor eyesight, but this is completely false. Deer have very good eyesight. Their eyesight is roughly five times better than that of humans. What’s more, deer eyes can spot very slight movements, which helps the animal avoid predators or hunters. Deer hear well, but for the most part, their hearing is very similar to that of humans. But compared to other mammals their hearing is not exceptional. Interestingly, humans are better at hearing low-pitched sounds, while deer are better at hearing high-pitched sounds. Some hunters are under the impression that older, bigger bucks have the largest ranges. Research, however, proves this is wrong. 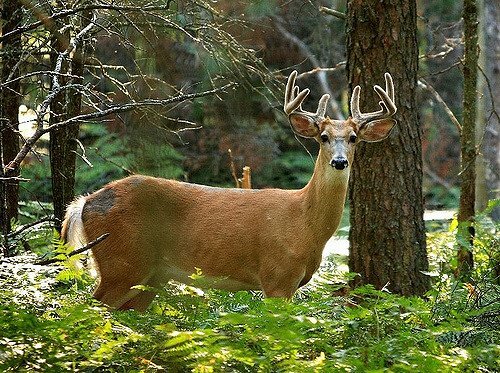 Smaller, younger bucks tend to have the largest ranges. Older, wiser bucks will take the best habitat, but it is generally a smaller area. It is important to note that during the rut, those older, bigger bucks will leave their range in order to find suitable does. A highly recirculated myth suggests that the lunar cycle affects the deer rut. This is absolutely a myth, proven by significant research. In actuality, does in a given location breed at the roughly the same time every year. This is a biological process, unaffected by the phases of the moon. Most deer hunters have heard the myth that they should never urinate near their stand, because it will scare the deer away. This well-traveled piece of fiction has absolutely no basis in reality. Numerous studies have shown that human urine has no effect on deer behavior and will not scare the animals away. This fact may bring relief to many hunters the next time nature calls while they are hunting. It is important to note that while human urine will not scare deer away, your movements while urinating can definitely scare them away. When shots are initially fired, deer will run for cover, but shooting is unlikely to drive deer away from their home range. Deer like what is familiar and do not want to move somewhere else if they do not have to. Continued shooting will likely make deer more leery and may make them alter their activity. However, the deer will likely remain in their range.